Ardagh has helped with the development of the redesigned iconic Malibu bottle, retaining all the fun and energy that characterizes the brand and adding more of a contemporary, modern feel. The new bottle also hits the right environmental note, setting the highest standard in weight reduction for this class of bottle. Ardagh's product development team used advanced design technologies to reduce the blow blow production to best in class weights of - 450g for the 70cl version and 455g for the 75cl - whilst retaining all the design features of the bottle. A new clear window around the bottom of the bottle maximises shelf-appeal by highlighting the fresh, clear spirit and bringing to life the energy and warmth of Malibu in a highly contemporary way. The new logo is clean and modern, evoking the free and easy spirit of MALIBU. It captures the inspiring moment when the setting sun meets the beach, and the day opens up into an even better time. Katarina Nielsen, Global Brand Director at MALIBU, says: "MALIBU is the coconut and rum based spirit with a vibrant Caribbean mindset – and our iconic white bottle is well-known worldwide. But even something great can evolve. And that's just what we've done with the new design." "We've refined everything – the logo, symbol and the typography – and the bottle shape itself. 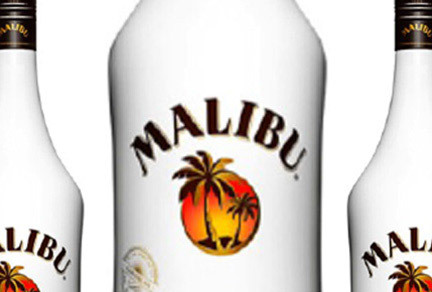 The new bottle is more slender with high shoulders, giving it a distinctive, modern feel that appeals to everyone – and emphasizes the unique MALIBU character," says Anna Kamjou, Global Director Design Strategy at The Absolut Company.